No well-thought out educational tool would be complete without resources aimed at how to take best advantage of its features. Nordic 4DFrame is the only place where you can get on-site teacher training from certified coaches who have themselves been taught in Korea. Cooperation and exchanges between those who use the material is of great importance and there is a network where such information is shared. Nordic4DFrame can also help your school, museum or science centre set up a 4DFrame Centre devoted to the use of this exciting educational material. There one can get a more in-depth experience, see finished models and try to build in different ways and with different methods. In addition, you can also find instruction sheets to different 4DFrame models or the results of research using this educational tool. Don’t know what you want to build? For those of you who work with the subjects of astronomy and space, you might find the 4DFrame models below of interest. Tip: The multipage step-by-step PDF files can be used to be shown on a screen. Like for any teacher around the world, a classroom aide is most helpful when it can be used in conjunction with the approved curriculum for the subject being taught. Educators for all grade levels ask if 4DFrame can find a place in such activity, and the answer is yes! The following is a list of various subjects covered in the Swedish curriculum for primary school grades 1 through 9 and how 4DFrame can contribute to your students’ education. Utilizing the principles of science and mathematics—and using the innovative 4DFrame materials—every shape imaginable can be produced. Everyone has a need to create something. 4DFrame provides them the tools—no matter their age—to help turn those inner desires into a physical object. 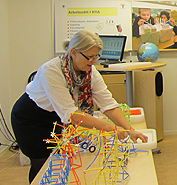 KomTek in Järfalla is a Swedish science- and technology-oriented activity centre that regularly uses 4DFrame materials in its programs both in-house and with local schools. Anna Nytomt Kristensson is one of their staff who works with this and she shared this set of activity tips KomTek developed (thank you, Anna!) for using this educational teaching tool. Every 4DFrame kit comes with its own instruction sheet on how to put that particular model together. The instruction sheets shown here are samples to show both how easy, and how much fun it is to build them. 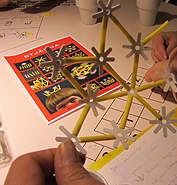 Sharing the example of the 9-10 January 2015 Workshop at the Swedish Museum of Science and Technology, Stockholm, and the Nordic4DFrame office, Vaxholm. 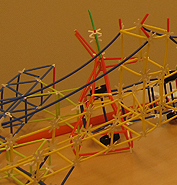 One ambition is to set up smaller 4DFrame Centres at schools, museums and science centers that are initiated by enthusiastic teachers or museum staff members who have completed 4DFrame training. This has already happened at many places in Sweden. If set up in a school, collaboration with a nearby Science Centre can be important and mutually beneficial. Nordic4DFrame can arrange – in autumn associated with the international 4DFrame competition – a study trip (at the participant’s own cost) to Korea for school, museum and science centre teachers who want to increase their skills and knowledge in the use of 4DFrame plus teaching science in general. Included is interaction with 4DFrame staff members in Seoul as well as visits to Korean schools and other venues. What better way to become inspired in the use of 4DFrame than the place where it all started in a country that has one of the highest ratings for education in the world? If this sounds like something for you, please contact Nordic4DFrame to find out more about this overseas adventure in education. Here are some links that may be of use for users of 4DFrame materials. They can be from other users who have activities and experiences to share, companies of interest, even some blogs.